WASHINGTON (AP) — Air pollution is killing 3.3 million people a year worldwide, according to a new study that includes this surprise: Farming plays a large role in smog and soot deaths in industrial nations. Scientists in Germany, Cyprus, Saudi Arabia and Harvard University calculated the most detailed estimates yet of the toll of air pollution, looking at what caused it. The study also projects that if trends don't change, the yearly death total will double to about 6.6 million a year by 2050. 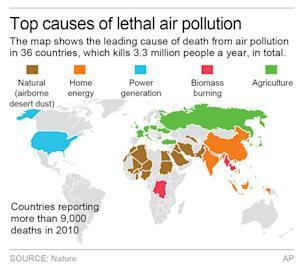 "About 6 percent of all global deaths each year occur prematurely due to exposure to ambient air pollution. This number is higher than most experts would have expected, say, 10 years ago," said Jason West, a University of North Carolina environmental sciences professor who wasn't part of the study but praised it. The United States, with 54,905 deaths in 2010 from soot and smog, ranks seventh highest for air pollution deaths. What's unusual is that the study says that agriculture caused 16,221 of those deaths, second only to 16,929 deaths blamed on power plants. "We were very surprised, but in the end it makes sense," Lelieveld said. He said the scientists had assumed that traffic and power plants would be the biggest cause of deadly soot and smog. Agricultural emissions are becoming increasingly important but are not regulated, said Allen Robinson, an engineering professor at Carnegie Mellon University, who wasn't part of the study but praised it. Ammonia air pollution from farms can be reduced "at relatively low costs," Robinson said. "Maybe this will help bring more attention to the issue." In the central United States, the main cause of soot and smog premature deaths is power plants; in much of the West, it's traffic emissions. Jason West and other outside scientists did dispute the study's projections that deaths would double by 2050. That's based on no change in air pollution. 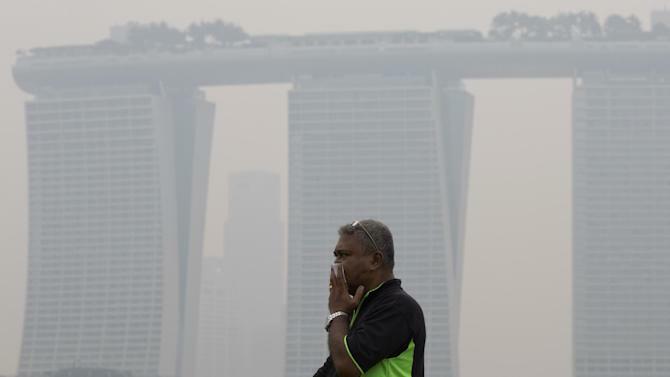 West and others said it's likely that some places, such as China, will dramatically cut their air pollution by 2050. And Lelieveld said that if the world reduces a different air pollutant — carbon dioxide, the main gas causing global warming — soot and smog levels will be reduced as well, in a "win-win situation in both directions." LONDON (Reuters) - Air contaminated with pollutants such as ozone and tiny particles could cause the premature death of about 6.6 million people a year by 2050 if nothing is done to improve air quality, scientists warned on Wednesday. "This is an astounding number," said Jos Lelieveld of the Max Planck Institute for Chemistry in Germany, who led the research. "In some counties air pollution is actually a leading cause of death, and in many countries it is a major issue."